Eating fruits and veggies during the 7-day Healthy Cleanse doesn’t need to be boring. 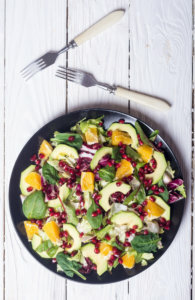 Try these easy, delicious and healthy recipes to keep you going! Combine oil and garlic in small bowl and run mushrooms with mixture. Place mushroom cap side down on an oiled baking sheet. 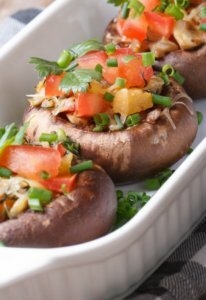 Season with salt and pepper and then arrange the basil and tomato slices in a circle on top of mushrooms. Bake at 450F until done, about 3 minutes. Preheat oven to 400F. Mix veggies (except spinach) with oil, garlic, salt, pepper, and all dried herbs. Place in the oven and bake for about 25-30 mins. 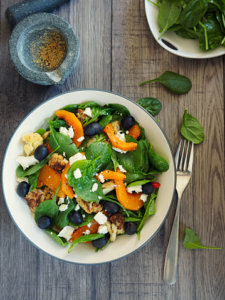 In a salad bowl, combine the spinach with roasted veggies, lime and enjoy! 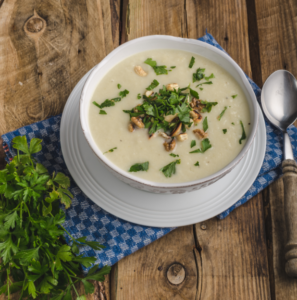 Purée the soup in batches in a blender to a very smooth, creamy consistency. Pour back into pot and let it rest for 20 minutes to get a thick consistency. Thin the soup with 1/2 cup hot water. 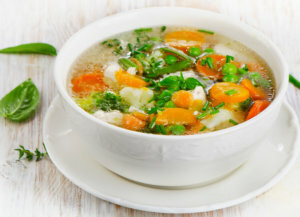 Reheat the soup. Top with a drizzle of extra virgin olive oil, cilantro and freshly ground black pepper to taste. Heat a saute pan on medium to high heat. Add 1 Tbsp. olive oil. Once the oil has warmed, add the zucchini noodles. Saute for about 3-4 minutes and then place on paper towels to drain some of the liquid. Add 1 Tbsp. olive oil to the already hot pan. Throw in the onions, peppers, and tomatoes. Saute for about 5 minutes. Sprinkle cilantro over the veggie mix. 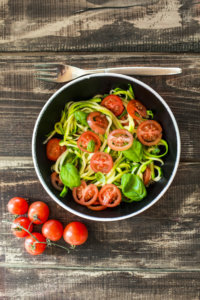 Plate your “zoodles” and place the sautéd veggies on top. Squeeze the lime juice over the veggies. Top with the sliced avocado and salsa. Enjoy! 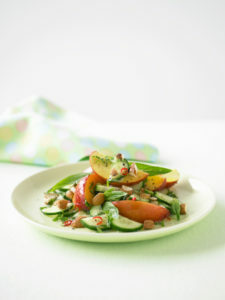 Combine peach, tomato, carrot, lettuce, onion, and cucumber in a large bowl. Mix olive oil, lemon juice, vinegar, salt, and pepper. Pour over peach, tomato, carrot, onion, and cucumber. Toss well to coat. Garnish with basil. Combine vinegar, oil, salt and pepper in a large bowl. Add vegetables and toss well. Arrange vegetables in a shallow, lightly greased roasting pan. Bake at 475 degrees for 10 minutes. 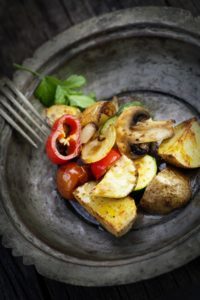 Turn vegetables over with a large spoon or spatula and bake for another 10 minutes or until tender and browned. Once vegetables are cooked place in a bowl and add pesto and toss to coat evenly. Bring the broth to a boil in a large saucepan and add the vegetables. Reduce the heat to low, cover and simmer, until the vegetables are tender. Simmer for 4-5 minutes. Garnish with cilantro and serve hot. In a small bowl, mix olive oil, salt, pepper, paprika, garlic, lime juice together to make a dressing. Combine all other ingredients together in a large salad bowl. Pour dressing over the salad and enjoy!